Seavus Project Viewer 15 has been integrated with Skype for Business and offers full collaboration with direct communication options to project team members. Skype for Business (previously known as Lync) is a widely used business communication and collaboration application. It represents a powerful productivity tool for companies by providing a combination of instant messaging, video conferencing and file sharing. Start Instant Messaging (IM) with any team member. With these features, users can view the online status and collaborate with team members in real time, share information, or find and implement faster solutions for the project issues, thanks to this agile approach of communication. “Many times, project team miscommunication and a lack of clear task understanding has been a source of project delays and failures. Therefore, this new release of Seavus Project Viewer 15 brings enhanced collaboration features for the team members and thus lowers the project risk.” Magdalena Jovanovska, Business Development Manager. Moreover, this latest release of Seavus Project Viewer provides the use of multiple timeline view, creation of “Resource Usage” Graphical Reports and brings improvements in the work with the Team Planner View, the “Resource Usage” filter and Project Server 2013. 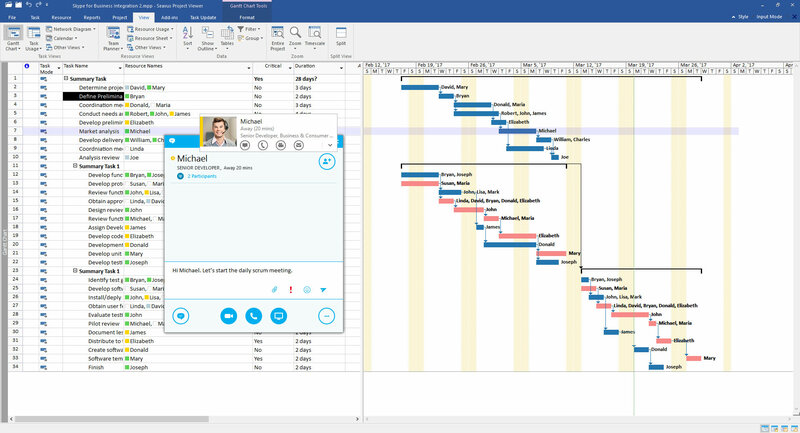 With the Multiple timeline view feature Seavus Project Viewer users will be able to insert any task from the project plan in a timeline view and create their own timeline for emphasizing important tasks. Skype for Business is a trade mark of Skype, and Seavus Project Viewer is not affiliated, sponsored, authorized or otherwise associated with the Skype group of companies. Seavus® is a software development and consulting company with a proven track-record in providing successful enterprise-wide business solutions. The company has over 650+ IT experts worldwide and offers a variety of products and service options, successfully covering the European and US market from several offices in the world. Their expanding portfolio covers: BSS/OSS, CRM, CEM, business intelligence solutions, ALM, embedded programming, business and consumer products, mobile and gaming solutions, managed services, as well as custom development, consultancy and resourcing. The Seavus portfolio includes over 3,500 customers, including leading worldwide telecoms and handset manufacturers, organizations from the banking and finance industry, consumer electronics, technology, education, government, and health, to name but a few. Seavus is a globally authorized master distributor of I-Produkts for Seavus Project Viewer.